If there’s something you want to be of the utmost quality in your kitchen, it’s got to be the tiles used to furnish it. You need titles that are strong and long lasting, resistant to the forms of damage you’d expect from a kitchen environment- burning, scratching, water damage, staining, cracking etc. Not only for aesthetic reasons- you want your kitchen to look nice, after all- but also for reasons of safety. Cracked titles can lead to cuts or trips depending on their placement, and can be very difficult to fix without the aid of a trusted craftsman. Thankfully, we take our dedication to quality materials incredibly seriously; no element of our ultra modern, German style package kitchens is anything less then the best it can possibly be, up to and including our tiles. All of the tiles found within our kitchens are provided by trusted suppliers, specifically the Cosentino group and Mirage. In fact, all of the tile work features in our showroom (including the floor tiling) have all been provided by Cosentino. The floor tiles in particular are from their Dekton range; Dekton Zenith, to be precise. 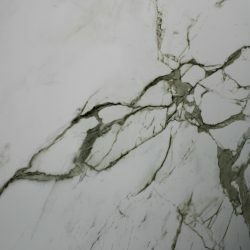 Whatever size, colour, finish, or specification of tile you require, you can be sure that we will supply it. If you require more information, don’t hesitate to give us a call. Alternatively, if you’d like to see an example of our tile work in action, come visit our showroom and see for yourself.